Planning your destination energy resources. In this tutorial we will discuss how to configure EVTO for each of the options. Often when you go to a destination you will plan on using your car for local trips such as sightseeing, shopping, local drives and other activities. In this case you might want to have EVTO include that mileage in its calculations in order to ensure and optimize your next segment planning. Select Edit Segment Details from the Plans menu. The Edit Segment Details dialog will appear. Change the value of the Local input field. The value will be in your units (mi or km). You have now reserved energy at your rated consumption rate for the duration of local travel you specified. Note: EVTO assumes that all of the reserved local travel energy will be consumed when you depart this destination for the next segment. You may need to adjust the next segments departure SoC if you have used more or less energy than planned. Another method to let EVTO know of your destination resource needs is to set a special Minimum Arrival SoC. Normally EVTO will arrive at a destination at your default Min SoC as found in Settings. This value however can be changed for each destination. 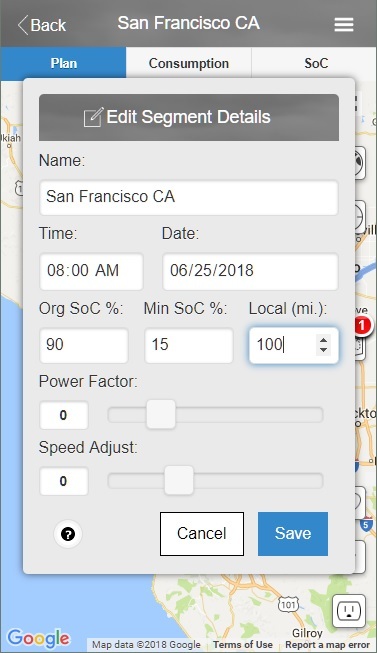 Note: For non charging destinations EVTO will automatically pick the most optimal Minimum Arrival SoC when you perform an Refresh Auto Chargers. Select the destination pushpin (checkered) on the map. The Waypoint Inspector for the destination will appear. Select the edit button (pencil button). The Edit Waypoint dialog will appear. Drag the Minimum Arrival SoC (%) slider to the level you wish to arrive at. 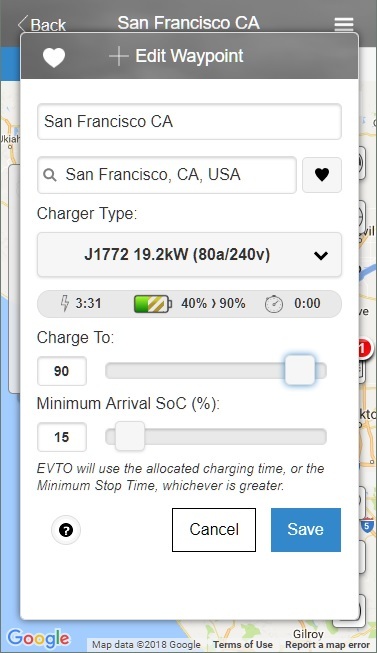 EVTO will now calculate your segment and determine the energy needs and charging of any segment chargers. Note: If after making all of your changes the waypoint icons turn yellow or red, it is advised that you select Refresh Auto Chargers from the menu to optimize the automatically allocated superchargers. 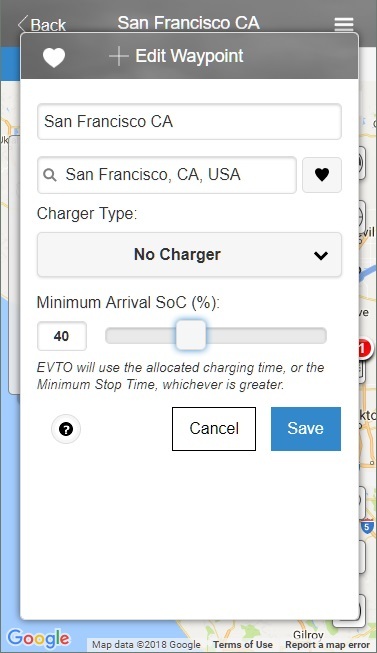 If the destination has a charger you can have EVTO estimate the time required to charge the car and ensure you have that level of energy when you leave the location. Choose the charger type for this destination from the Charger Type pulldown. Drag the Charge To value to the amount of state of charge you wish to leave the destination at. 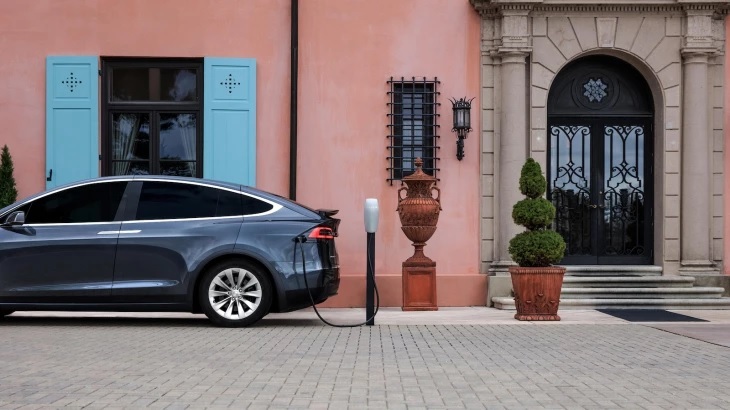 You have now indicated to EVTO which charger type you will be using, the level you wish to charge to and EVTO has indicated how much time it believes you will need for the charge. In addition EVTO will use this level as it’s starting level for the next (paired) segment. We have shown you how to plan for your destination energy resources and to configure EVTO to plan for local travel at the destination. In addition we have shown you how to indicate that this destination has a charger and how to inform EVTO to what level you expect to charge to. Be sure to review all of the EVTO website content when you get a chance to increase the effectiveness of your use with EVTO in trip planning.